Winter sports were remarkable this year! This winter, Williston was represented by 345 students coached by 39 coaches on 23 different teams. All told, our winter teams represented Williston in 340 contests with 58 different schools in six states this winter. The girls squash program enjoyed seasons of great improvement and comradrie this winter under the leadership of varsity coach Ken Choo and JV coach Adeleen Brown. With the exception of captains Lindsay Whipple and Mika Sovjani, the Varsity team was an entirely new team including two first time squash players. Predictably, this was a rebuilding year for the team but the positive spirit and camaraderie were evident throughout the season as all team members gained valuable playing experience. Despite the winless season, each girl competed hard and demonstrated notable improvement. Two narrow 4-3 losses to Canterbury and Hopkins were highlights as the girls pushed these two more experienced teams to the final match before coming up short. In the season-ending Class C tournament, Dylan Fulcher-Melendy distinguished herself by going 3-2 in her flight to finish in sixth place. Lindsay Whipple, Mika Sovjani, and Katie Borden all won matches in the tournament. Next year’s captain will be Mika Sovjani ’18. All three boys squash teams enjoyed competitive seasons. Under coaches Simpson and Ravis, the Thirds team demonstrated notable improvement throughout their season. Coach Chiavaroli’s JV team also demonstrated great improvement notching six victories during the season including a shutout win over Salisbury and a thrilling 4-3 victory over Suffield. It was an exciting and rewarding season for Coach Tyree’s varsity squash team notching eight wins for their best finish since the 2009-10 season. Led by junior captain Henry Poehlein, the season started off very well with wins over St. Mark’s and Kingswood Oxford. This was followed by a thrilling win over local rival Suffield. Other highlights were a convincing and equalizing 5-2 win at home over Salisbury after dropping a 3-4 loss on the road earlier in the season, competitive losses to Berkshire, Loomis, and Westminster, and season ending wins over Canterbury, St. Mark’s, Pomfret, and Kingswood. Senior Zack Robbins proved to be a terrific reliable competitor, and returners Joe Shively, Tyler Senecal, and Wiley Jung all provided strong seasons to go along with the contributions of newcomers Nithish Raja and Joey Robbins. Led by coaches Hing, Eberle, and Seamon, our ski teams enjoyed successful seasons competing in the Mountain Institute League. The team enjoyed a great deal of success during the weekly Wednesday races held at Berkshire East. The season culminated with the New England Class B championships held at Okemo Mountain in Vermont in the middle of February. Both of our teams competed well with the other 13 competing schools. There were 46 competitors in the girls’ race. The team was led by junior captain Sophie Carellas who had a tremendous day finishing in 7th place in the Giant Slalom and 3rd in the Slalom. Sophie’s top-three finish in the Slalom earned her All NEPSAC honors. As a team, the girls finished in 9th place at the championships. The boys’ team also had a successful day at the championship race finishing in 6th place. There were 64 competitors representing the 13 competing schools. Our top performers in the Slalom race were seventh grader Matt Weinstein at 24, junior Bryan Soder at 23 and coming in first place for the second consecutive year was senior captain Devin DeVerry. In the Giant Slalom race, Oliver Lawrence came in 30th, Gavin Girardin 22nd and 1st place was Devin again! To our knowledge, this is the first time in our school’s history that one of our skiers won both the Slalom and the Giant Slalom at the NEPSAC Championships. Devin also finished in 1st place in the Mount Institute League skiing against the top prep racers in Western Mass. He is certainly the first Williston skier to accomplish this feat in many years as well. To top all this off, at the final race, the league awarded Devin the Zephyr Rapinchuk Memorial Award. This award is given “to a student who best exemplifies kindness, enthusiasm, a love of skiing and mentoring others.” This award was a fitting tribute to not only Devin’s outstanding career as a racer but, equally important, the manner in which he represented Williston. To recognize Devin’s accomplishments, Mr. Conroy called him forward and presented him with a memento of his tremendous season. Captain for next year will be Sophie Carellas ’18 again. Captains for next year will be Oliver Lawrence ’18 and Bryan Soder ’18. The JV boys hockey team, led by Coaches Fay and Hunter, played competitive hockey all winter. The team enjoyed several wins including an exciting 4-3 win over Pomfret and a decisive win over Vermont. Under Coaches Cunha, Hanford, and McCadden, the Varsity Boys Hockey team competed hard all season playing its usual very competitive schedule—consider that 14 of the 28 teams on our schedule made the NEPSAC postseason tournament including five who played in championship games. The team enjoyed several highlights during the season including defeating Salisbury 6-1 for the first time since 1997 and defeating Gunnery 4-1 for the first time in 15 years. The team had a terrific 3-2 overtime victory over host St. Sebastian’s at their holiday tournament in December. Some of the most exciting games took place in late January when, during a three game stretch, the boys beat both Millbrook and Westminster in overtime and earned a thrilling 1-0 victory over Brunswick at home before our alums. This winter was another successful season for our girls basketball program. The JV squad had a competitive season under Coaches Sawyer and Garcia finishing with a 7-9 record. Highlights included sweeping Suffield in both their games and big wins over Pomfret and WMA during the last couple weeks of the season. Varsity girls basketball, under Coaches Rodgers and Whipple, enjoyed another very competitive season this winter. Highlights of their season included some terrific efforts with some of the best teams in NEPSAC including two narrow three-point losses—one to a strong team from Taft and one on the road against the number one team in Class B, Berkshire. In both games, the girls played their hearts out only to come up short. Arguably, the biggest highlight of their season was a thrilling comeback victory over Deerfield 58-53. The team sent their seniors out on a high note with a season-ending win over Kent on Senior Day. The team was led this winter by two seniors who combined for 1,548 points during their Williston careers: Olivia Bonavita who had 621 points in three seasons and Sarah Marion who had 927 points in six seasons. For her outstanding play during the season, sophomore Sarah Sullivan was named a NEPSAC all star and represented Williston at the NEPSAC all star game held at Nobles. The next group I would like to recognize this morning is our wrestling program led by coaches KaneLong, White, and Rivenburgh. Despite only being able to fill out on average 9 out of the 14 weight classes, the wrestling team had a tremendous season finishing with a dual meet record of 13-6. The many highlights during their season included sweeping Salisbury and WMA in both their matches and terrific wins over Loomis Chaffee, Taft and Suffield. In Coach KaneLong’s 16-year career as our head coach, the team set a single season high with a 65 percent individual winning percentage with 195 wins and 92 losses. The team also had more pins than any team he has coached and, by far, the highest pinning percentage of any team by pinning their opponents in 80 percent of their wins. Speaking of pins, one of the individual highlights of the season was junior Kevin O’Sullivan making Williston wrestling history when he pinned his opponent from Avon in 4 seconds. Coach KaneLong says that is the quickest pin he has witnessed in his 40 years involved with wrestling. Very impressive, Kevin! At the NEPSAC championships held at Hyde School in Maine, two of our wrestlers earned All NEPSAC honors for their outstanding days. Postgraduate Peter Martinkus came in 6th in the 126 pound class while six year senior Hunter Adams capped off his career by finishing in 5th place in the 145 pound class. As we know from earlier this winter, Hunter became the first Williston wrestler in many years to surpass the 100 win milestone during his career. The captains of next year’s team will be Kevin O’Sullivan ’18 and Harrison Winrow ’18. On the lower levels, the JV, 3rds and 4ths teams all competed well and enjoyed successful seasons. The biggest highlights of the Garrity- and Ketcham-led JV season were two thrilling overtime victories over Deerfield and Loomis. Coach Beaton and Rivers’ Thirds team had an excellent season finishing with a record of 10-2 with a double overtime win over Winchendon and big victories over Deerfield and Loomis as highlights. Coaches Bryan Malinowski and Annie Schneider led the Mighty 4ths team to another stellar season finishing at 7-1. The team avenged its only loss versus MacDuffie with a decisive 10-point win in their rematch. Under the leadership of head coach Ben Farmer, the varsity boys basketball team enjoyed an excellent season with a record of 15-7 including going 8-5 in Class A. The team had remarkable team chemistry and played great team basketball throughout the season. While there were many great wins, here are a few that stood out: a nine-game winning streak going undefeated in the month of January, sweeping Deerfield in both our games, beating five tournament-bound teams, including decisive wins over Loomis and Avon Old Farms, and a final week in which the team went 3-0 including an 84-49 Senior Day victory over Tabor Academy. The team’s excellent season earned our five starters All NEPSAC Honorable Mention for their outstanding play during the season: Bane Terzic, Mike Mahoney, Duncan LeXander, leading scorer Spencer Danforth, and our floor general, point guard Kyle Henseler. The JV team, led by coaches Ward and Currie-Rubin, enjoyed another excellent season finishing with a 10-4-1 record. Among their many highlights were exciting victories over Choate, Berkshire, and Loomis Chaffee and a season sweep of rival NMH. Varsity girls ice hockey enjoyed another outstanding season under the leadership of coaches Christa Talbot Syfu, Alex Tancrell-Fontaine, and Erin Davey finishing with a record of 18 wins, 6 losses, and 3 ties. Highlights of their season included convincing wins over Cushing and St. Mark’s, sweeping Lawrence Academy in both games, a tremendous effort in a 2-2 tie at Kent, and a thrilling 4-2 comeback at Andover in which the team scored three third period goals. One other highlight worth noting was the team’s 4-0 shutout win over Hotchkiss in which they raised over $3,000 for breast cancer research. At the Winchendon Tournament held in early January, the team took home the championship for the third year in a row with a 4-0 shutout win over NMH. The team’s outstanding regular season earned them the #7 seed in the Division 1 tournament. In the quarterfinals, the girls played a tremendous game at Nobles before bowing 1-0 on a late third period goal. The team would like to thank its only two seniors, Gabby Monaco and Alexis Ryan for their leadership and dedication. In recognition of their outstanding seasons, juniors Julia MacLean and Tori Palumbo were both named Honorable Mention to the All NEPSAC team. No awards yet since the team has not had their final season-ending gathering yet. The boys swim team finished their dual meet season with a 2-6-1 record with wins coming against Westminster and Worcester. The team finished their season on a high note with their best swims of the season resulting in a 4th place finish at the NEPSAC Division II Championships held at Rhode Island College. The 400 Freestyle Relay team of David Fitch, Reilly Gluz, Jason Albanese and Sam Haddad placed third. The same four boys also earned All NEPSAC honors for their 2nd place finish in the 200 Freestyle Relay. Two boys had tremendous performances resulting in individual NEPSAC titles. Freshman Sam Haddad won the 100 Individual Medley and sophomore Jake Goodman won the Diving title to both become NEPSAC champions. This winter, David broke six school records in the 50 Freestyle, the 100 Freestyle, the 200 Freestyle, the 500 Freestyle, the 100 Butterfly and the 200 Individual Medley. Additionally, his swims in the 50 Freestyle, the 100 Freestyle, the 200 Freestyle and the 100 Butterfly were not only school records but NEPSAC Division II records. His qualifying times in the 100 and 200 Freestyle earned him All American consideration to be determined this spring while his times in the 50 Freestyle and 100 Butterfly earned him automatic All American recognition. Conroy asked David to come forward so he could present him with a memento of his record setting season. Junior Anabelle Farnham finished 2nd in the 200 freestyle and 3rd in the 100 freestyle. Seventh grader Ava Larkin finished 2nd in both the 200 IM and the 500 freestyle. The 200 freestyle relay team of Maya Soley, Emily Yeager, Ava Larkin and Sydney Joyce. The 200 medley relay team of Sally Alrutz, Natalie Aquadro, Maya Soley and Annabelle Farnham not only won their race but also set a new NEPSAC Division II record. Sophomore Sydney Joyce won both the 200 IM and the 500 freestyle. Both swims were also new school records. Mr. Conroy asked Sydney to come forward to accept a memento of this terrific accomplishment. Sophomore Sally Alrutz came in second in the 100 backstroke and won the 100 butterfly in a new NEPSAC Division II record. Sally also broke the school records in both events. Mr. Conroy asked Sally to come forward for recognition. Finally, Mr. Conroy said he didn’t think it was an understatement to say that Gabby Mercier is the greatest diver in school history. She had a tremendous senior year breaking her own school records in both the 6 and 11 dive competition. 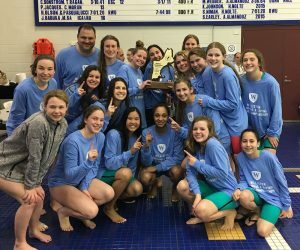 She also earned her second NEPSAC title in diving in not only a new NEPSAC Division II record but the best score ever by a NEPSAC diver in any division. “Wow!” He asked Gabby to come forward for recognition. 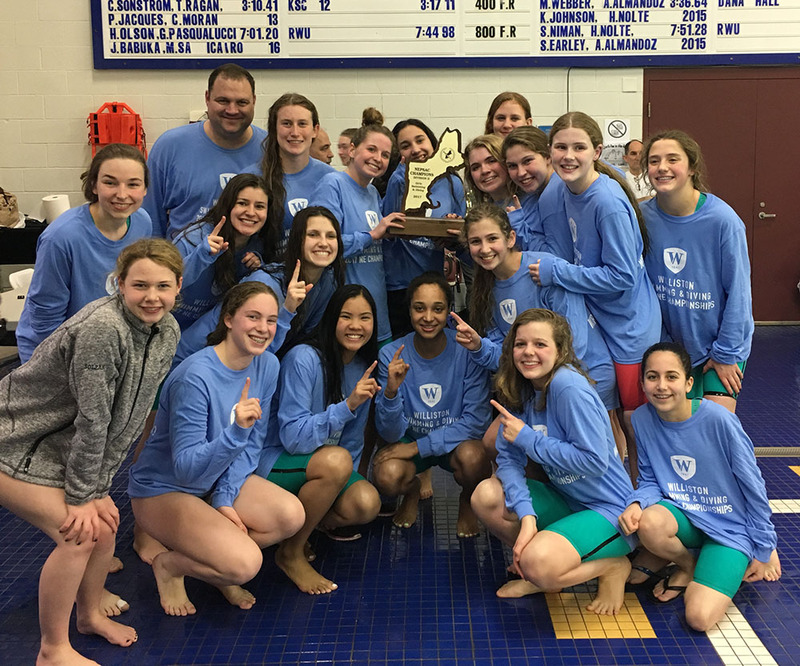 In winning their second straight NEPSAC Division 2 Swimming and Diving Championship, our girls scored a meet-record 451 points well ahead of second place Dana Hall who finished with 325 points. The girls dominated from start to finish. Mr. Conroy asked all members of the girls swimming and diving team to stand for a round of applause. He then asked the team’s captains to come forward to present their championship trophy. Good luck to all the spring teams and Go Wildcats!